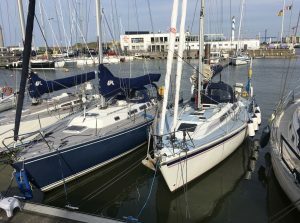 I’ve just had lunch with Pieter, Mieke and Aster at the Royal North Sea YC Oostende. It was lovely catching up with terrific friends. Tonight Raymond, ‘Drunken Duck’, is picking me up at 1800 for supper at their house. 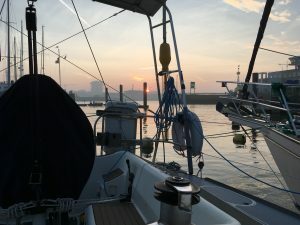 We sailed to Oostende from Ramsgate yesterday. Winds south westerly with a tad more west in them later in the day. It was a quick crossing with polite, courteous ships that all altered course for us. With a furled genoa ‘Talisker 1’ calmly continued under main sail, touching 6 through the water. The timing was perfect. 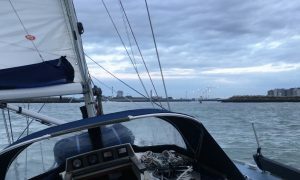 The current that had been with us for the whole trip had just turned west as we came in to Oostende Harbour. 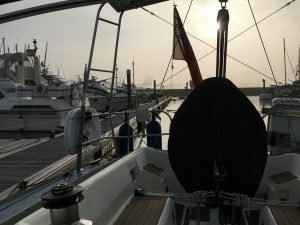 Pieter was waiting for us and we are now moored alongside ‘Plankzeil’ in the Royal North Sea Yacht Club. Lovely. 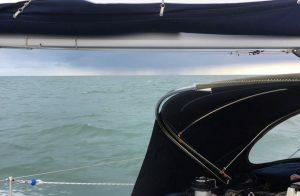 I dressed for some cold yesterday and ended up sailing in just my thermals. 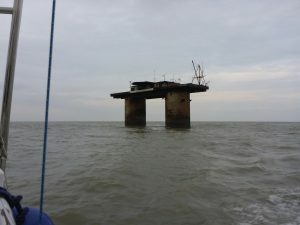 Only when we were approaching Oostende did I have to put oilies over the top as it got slightly cooler and wet. Today it’s glorious weather. Warm sunshine and blue skies. spending the night in Suffolk Yacht harbour having filled up with diesel. 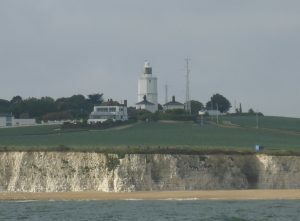 We were underway at 0300 BST Tuesday morning taking the last of the ebb out of the Orwell and out towards Black Deep where the flood carried us south through Fisherman’s Gat and then on down to North Foreland. 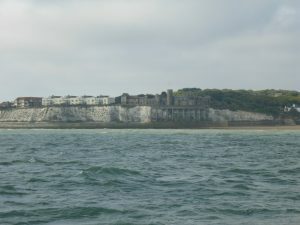 We arrived Ramsgate bang on slack water having sailed all the way. Again! 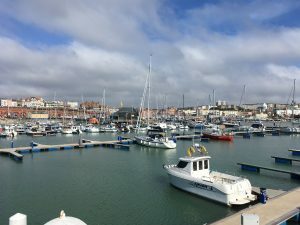 It had not been cold and Ramsgate was bathed in sunshine. 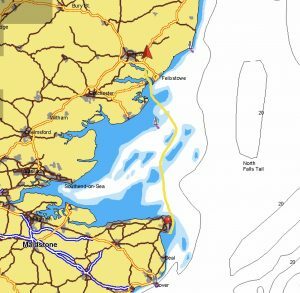 I’ve been home some time since getting home from Norway but we did get up to Southwold and brother David sailed back down the coast to Orford with us. It was great to see my brother enjoying the boat so much. I’ve also had a day on Thames Barge ‘Edme’ with Doc. That was fabulous. 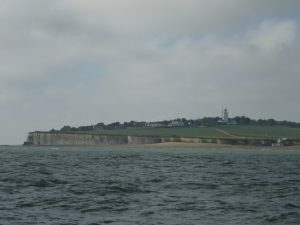 But there is no beating ones own boat and to be back at sea again before the end of the summer is wonderful. On Thursday night I had supper with Anne and Raymond ‘Drunken Duck’. Raymond came and collected me from RNSYC and took me to their charming house. It was lovely to catch up with their adventures from the summer. We nearly met so many times going up the east coast and in Scotland but the weather was against us. 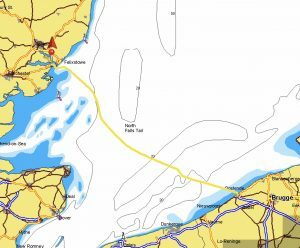 They gave up on Orkney and sailed through the Caledonian Canal. While I was weather bound in Stromness they were in Peterhead sheltering from the same weather system. YESTERDAY Pieter and Aster picked me up and drove me to Nieupoorte along the coast. 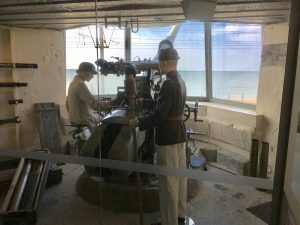 The second World War is very much in evidence here with the German Atlantic Wall preserved here, the menacing guns protruding from their bunkers and pointing out to sea. 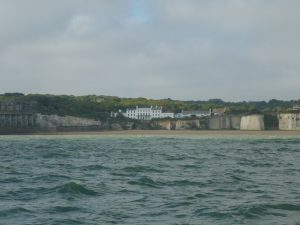 A small stretch of this coast has been preserved as a museum. The Atlantic Wall stretched from the top of Norway right down the French Atlantic coast. It was regarded as impregnable. 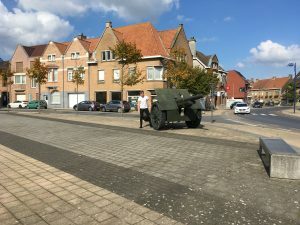 I wanted to see why, or certainly part of the reason, the German advance had been halted in the 1st World War at Nieupoorte. Much of the land surrounding Nieupoorte is below sea level and controlled by a series of major locks in the town. 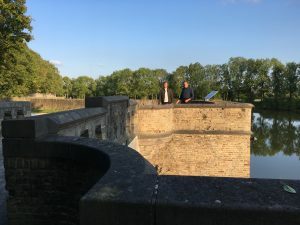 The Belgians decided to open the locks at high water and flood the land. 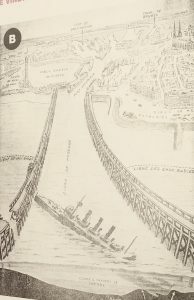 By opening the sluice gates the flat reclaimed land between the banks of the Yser River and the Nieupoorte-Dixmude railway line were flooded. 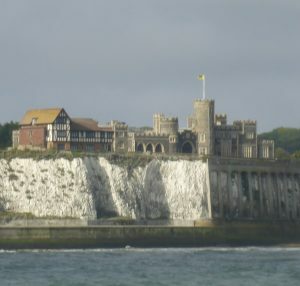 This was not an uncomplicated job at the time and the lock gates had to be opened, not only to time with tidal height, but also with wind direction. The Belgian engineers led by lock keeper Hendrik Geeraert succeeded admirably and not to mention bravely. 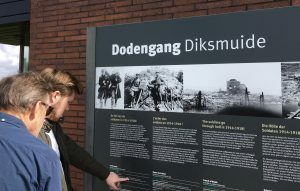 The front would certainly have been much further west but for the actions of these courageous men. 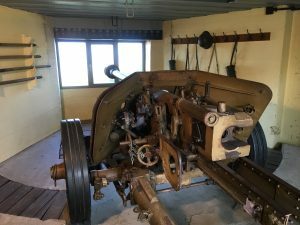 We then visited the Belgian ‘Trench of Death’ at Diksmuide. 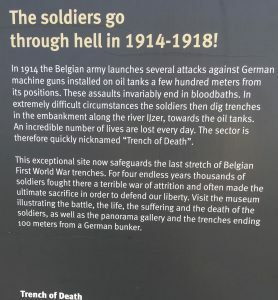 Heroic Belgian fighting took place here and a stretch of the trenches has been preserved. 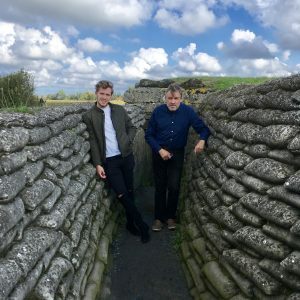 It’s the first time I’ve been in a 1st World War trench! 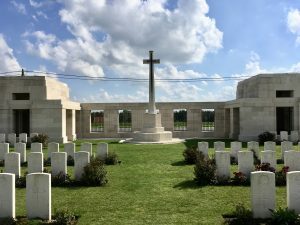 We drove to the Passchendaele New British Cemetary. 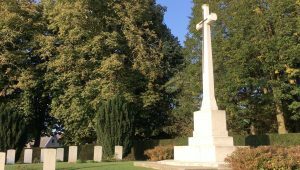 I was astonished by the grave stones, many baring the inscription “unknown soldier’. Others just a soldier of a particular regiment, the body perhaps identified only by a scrap of uniform. And then grave stones with the names of so many soldiers. Sometimes their rank and regiment is included and sometimes their number. 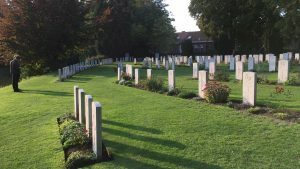 Many soldiers have no age of death on their graves. Almost certainly because their ages were unknown. But so many .. so many very very young men. We drove in to the village of Passchendaele. 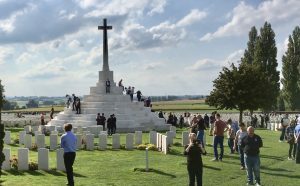 The Belgians take great pride in preserving the memorials. 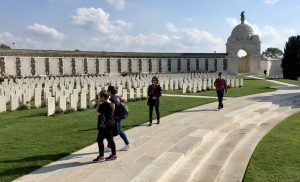 We then drove to Tyne Cot Cemetery. On the horizon you can see Ypres. 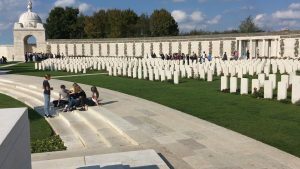 This is the largest cemetery in the world for Commonwealth Forces for any war. It’s near Passchendaele, near Zonnebeke. 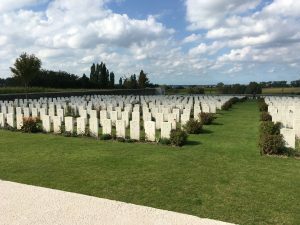 The remains of 10,000 soldiers lie here. It was busy and I was pleased to see children. There were coaches in the car park, many from the UK including one from Scotland. Of course its 2017! 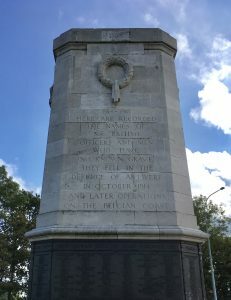 Passchendaele was fought at the end of July to mid November 1917! One hundred years ago! and parked in the square in the centre of town. Pieter told me that Ypres was raised to the ground in the 1st World War. After the war it might have been left as it was, a ruined city, as a memorial. The people of Ypres had other ideas and quite rightly wanted to return to their homes. There was discussion about building a modern city. Thankfully it was decided to rebuild and restore the ancient city and this was completed by 1925 with final touches in the 1930’s. King Albert and city architect Jules Coomans were strong promoters of restoration. It was an incredible feat! 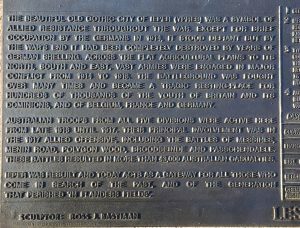 Most of the damage had been done by German artillery continuously shelling the city in 1917 and 1918. By the end of the war no building had been left untouched. The medieval town with its historic buildings and centuries of traditions had been destroyed. 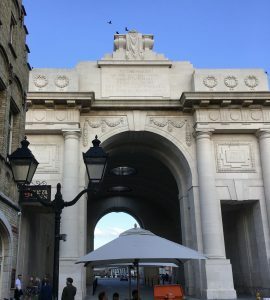 The British were allowed to build the Menin Gate Memorial. 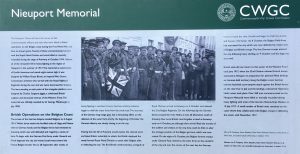 A daily ceremony of Remembrance has taken place here ever since its construction, except for the period of German occupation in the 2nd World War. Seeing this extraordinary memorial was more than thought provoking. where we visited the very small, beautiful and peaceful Ramparts cemetery. Of course there were plenty of New Zealand dead. I knew that! But Maori too! Of course there would have been Maori too. Ypres is a beautiful city. The pride the Belgians take in preserving the memories is palpable, everywhere you go. 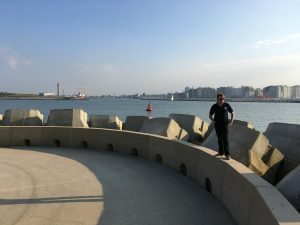 Yesterday afternoon I walked with Pieter to the pier heads on the east side of the new Oostende mole. 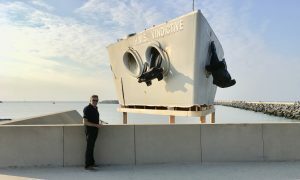 We passed the bow of HMS Vindictive, which is preserved as a war memorial. 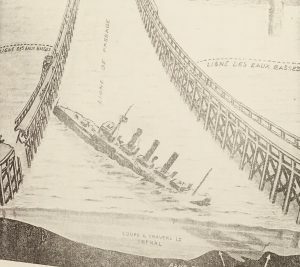 She was sunk in the mouth of Oostende harbour on the 10th May 1918 as a blockship to prevent the Germans using Oostende harbour. Last night I had supper at Mieke and Pieter’s apartment with Johan and Greet. Today I had another incredible experience. 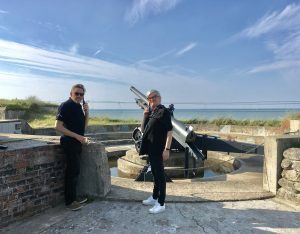 Pieter and Mieke kindly took me to see the museum of the German Atlantic Wall at Raversyde. 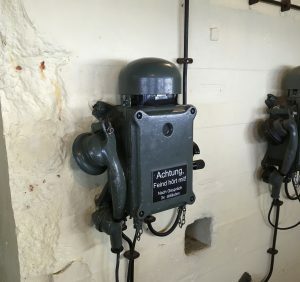 Bunkers, observation posts, artillery positions, subterranean corridors constitute one of the best preserved parts of the infamous Atlantic Wall. We were also able to visit the house of Prince Charles (1903-1983). I’ve spent another fabulous day with my friends in Belgium. I think there is more good weather tomorrow and this seems to last until at least Thursday. There is little wind forecast for Tuesday and Wednesday. So with ‘some’ wind tomorrow, we are sailing home and hoping for a bit more wind than is forecast. I hope to meet up with Harry and James R in ‘Dura’ tomorrow night. 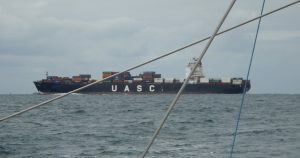 Yesterday me and ‘Talisker 1’ sailed from Oostende to Harwich. 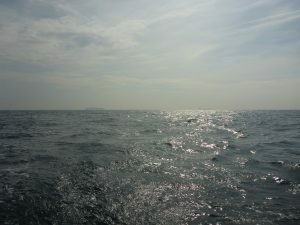 From early afternoon the sailing was fabulous as we finally got some wind having motor sailed most of the morning. 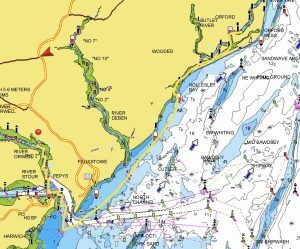 We had just cleared Noord Hinder South TSS when the engine was switched off and ‘Talisker 1’ turned in to the powerful machine she is under sail with a consistent 17 knots over the deck from the east. She’s a true mile eater. my mobile telephone came to life. 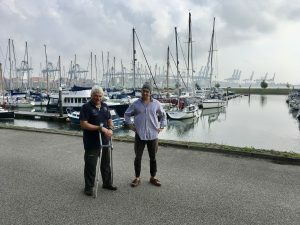 A message from James R and Harry to say they were in Shotley Marina. Harwich VTS are really on their guard. 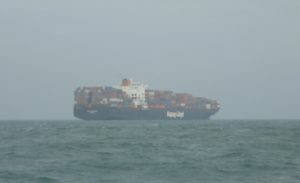 As I was ‘heaving to’ off Languard to let a ship go by they called us on VHF channel 71. They thought I was going to cross the deep water channel with a ship on her way out. This is the second time I have been called when heaving to in the same position. I wonder if there has been an incident this year with another yacht that has made them nervous? We came in to Shotley in the dark and James R and Harry took our lines. 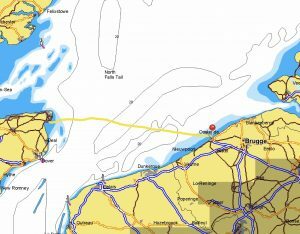 It was a good crossing of the southern North Sea. Visibility was at times moderate.